Local watercolorist Robin Samiljan merges art with poetry in her new work, which is on exhibit at the Abbot Public Library in Marblehead through the month of January. The exhibit features a series of abstract and landscape paintings paired with haiku poetry. The Swampscott-based artist explains that her concept is actually an ancient art form. 'Verse embedded into the body of paintings is an ancient Asian art form that has existed for centuries. Inspired by the poetry of eastern Haiku masters, I began incorporating haiku poems that combined with the visual elements in my paintings to evoke the potential for a more complete spiritual awareness,' she said. The result is a stunning display of emotional art that takes the viewer beyond the visual, to experience the paintings on more than one level. There are also other paintings in the show, and all are accompanied by poetry. Samiljan describes her love of art. 'I live life with intensity and passion, and that is why I paint. I am inspired by the natural elements that surround us, and I use color and shape as a base for the creative viewing of my theme. My most successful paintings draw the viewer into the place or feeling I have created, and a shared communication develops between us,' she said. Samiljan's passion for art dates back to her college days, when she graduated with a BA in Fine Arts and Art History from Vanderbilt University. She studied with, and has been inspired by, local Marblehead artist Nordia Kay. 'Nordia taught at the JCC, and my son was there in the Prime Time program. It was a perfect opportunity for me to learn watercolor,' Samiljan said. She continued her study with Jeanne Carbonetti, an artist in Vermont. 'I called her, set up some studio time, got in my car and drove to Vermont. That was very unusual for someone like me, but it was a fantastic experience,' she said. 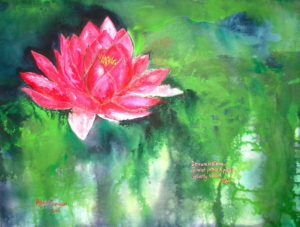 Her Lotus series currently on display at the library is not her first collection of paintings. In her Full Moon Series, the artist painted the full moon each month for a year. Each painting is filled with passion and energy. Recently, one of the paintings was chosen by the Cancer Center at Massachusetts General Hospital to appear in its 2007 calendar, an honor accorded to only a dozen people.